This exercise is a variation on the Pilates Stomach Series. The soft ball adds a proprioceptive challenge to the pelvic stability required in this exercise. To do this exercise you will need a mat and a soft ball. Start by lying on your back with your head, neck, and shoulders on the ground and the soft ball underneath your pelvis. Exhale as you bring one leg followed by the other up to a tabletop position. Then inhale again and exhale as you lengthen one leg towards the opposite wall. Exhale again as you switch your legs reaching the other leg towards the opposite wall and then complete two switches while inhaling. Repeat for then breath cycles before resting. In this exercise, the pelvis is elevated on an unstable surface. It is important to exhale completely and to inhale into the back of the ribs. 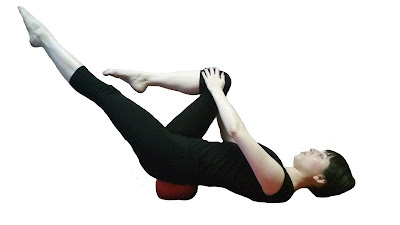 This allows the ribcage to stay grounded which will keep the pelvis stable on a wobbly ball. You can either have your hands by your sides or you can reach each hand towards the opposite knee as it bends. The latter will increase the challenge of the exercise.